UP TO 7 GUESTS, 3 large BEDROOMS, 3 BATHROOMS, large GARDEN. UBICATA in Casal Velino Marina in a strategic area to reach all the destinations of Cilento. WONDERFUL VILLA modern and well-cared distributed over about 160 square meters with green and independent outdoor spaces that allow you to comfortably accommodate up to 7 people. Our vacation home is ideal for those seeking a quiet and reserved place near the beaches and the sea of ​​the Cilento Coast. 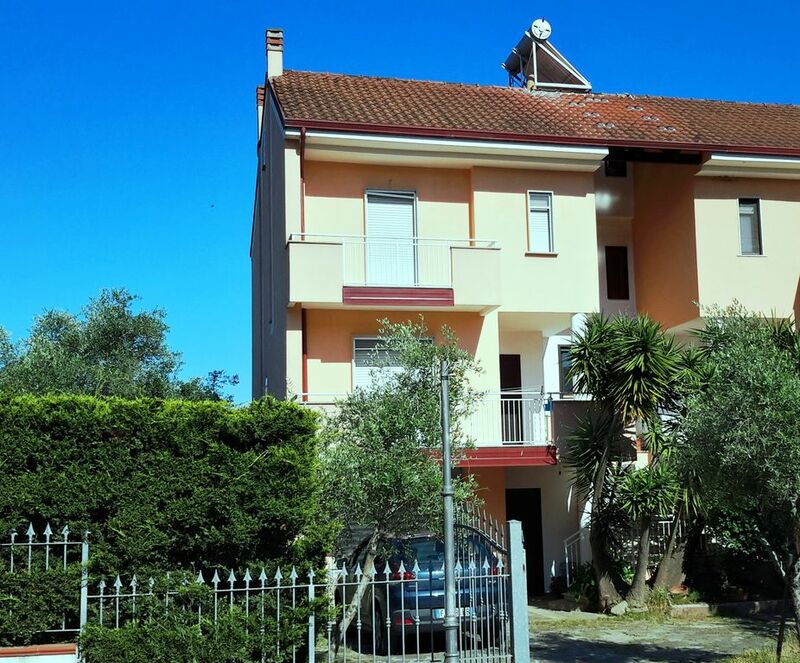 Located in a residential area of ​​Casal Velino, the villa is just a few minutes drive from the sandy beaches and the tourist center of Casal Velino Marina. --- KITCHEN AND EQUIPPED with seating for 6 persons. --- 3 MODERN BATHROOMS: one with bath, one with shower and an 'other service. The villa is surrounded by a green ENCLOSED GARDEN that offers spacious areas for relaxation, an area equipped for outdoor dining and barbecue do. Ideal for families with children and for those who want to spend his holidays with his four-legged friend! It is characterized by the presence of a PRIVATE INDOOR PARKING for 2 cars and outdoor parking. The house also has a washing machine, oven, refrigerator with freezer and each room has French windows with mosquito nets and this makes it light and cool during the summer. INCLUDED IN PRICE: Package of water consumption, Electricity, Gas. The home was perfect for us. It was spacious, had a large bathroom, and felt very homey and comfortable. It was also beautiful and in a wonderful location. It is an easy drive to many tourist attractions, and the village it is in is also lovely. We would definitely stay there again! Questo è il secondo anno che ci torniamo perché ci siamo trovati benissimo. La abbiamo scelta nuovamente per la posizione abbastanza comoda (circa 5 min dalla spiaggia ) vicino a tutto e perfetta per chi vuole frescura e tranquillità la sera. La casa ha una sistemazione perfetta per una famiglia, è molto spaziosa e luminosa, arredata intelligentemente, completa di ogni accessorio (non occorre nulla da casa) ha un sacco di spazio per riporre le cose per una lunga vacanza. Inoltre avendo doppia esposizione è estremamente fresca anche nelle giornate più calde. Infine la cordialita' e disponibilita' dei proprietari. Ho soggiornato con mio marito ed una coppia di amici con 2 bambine nell’ultima settimana di maggio. presenta camere grandi e un ampio spazio esterno, perfetto per pranzi e cene all’aperto. La casa è situata in una via tranquilla ma si collega subito alla via principale che porta al mare, distante 5 minuti con la macchina. Trovato tutto pulito e tenuto ottimamente. I proprietari sono cortesi anche di più e si è creato subito un ottimo feeling. Ci è piaciuto molto e ritorneremmo per l’estate. Vi lo consigliamo vivamente. "Unico piccolo neo, le attrezzature da cucina, ma le nostre richieste sono state prontamente esaudite dai proprietari che si sono dimostrati molto disponibili e cordiali." Resorts of the Costa del Cilento, Marina di Casal Velino is known for the long sandy beach in the heart of the National Park adjacent to the archaeological area of ​​Velia. In the summer months it is fervent for many swimmers arriving at resorts, hotels and residences. It 'a town full of many nice shops, pizzerias, restaurants with typical local cuisine and to spend the evenings. Marina di Casal Velino also has a port for the mooring of tourist boats and small fishing boats. Car recommended. Motorway A3, Sa - Rc, exit Battipaglia, then continue on the SS variant 18 to the junction of Omignano Scalo or Vallo Scalo, and then continue towards Casal Velino - Acquavella. Line Salerno - Reggio Calabria station Vallo Scalo. Fiumicino airport - Rome c. to 360 km. In summer makes a stop at the port of Casal Velino the Metro del Mare connects the main coastal resorts of Cilento with the island of Capri and the Amalfi Coast. In addition, there are boats that organize tourist trips to the caves of Palinuro and the coast of Cilento both day and night. Cilento Explorer offers trips to PALINURO and BAY INFRESCHI (active duty from 9:00 to 17:00), as well as evening trips (from 21:30 to 22:30) and fishing tourism. The Diving Centre Elea based in Casal Velino allows you to easily DIVING in the territory that goes from Palinuro to Licosa. There are many coastal resorts and inland of Cilento that during the summer organized gastronomic events offering the best of local food production in dishes expertly prepared according to ancient traditions. CONDIZIONE DI PAGAMENTO: 25% del totale dell'importo online, il restante 75 % al check- in in contanti. DEPOSITO CAUZIONALE: rimborsabile da pagare al check in di Euro 150. Consegna delle chiavi all' arrivo da parte del Proprietario. Il prezzo pubblicato nel calendario è da intendersi fino a 7 ospiti, Pulizie fine soggiorno € 50.